Oona Chaplin arrives at the premiere of HBO's "Game Of Thrones" Season 3 at TCL Chinese Theatre on March 18, 2013 in Hollywood, California. Inset: Charlie Chaplin in "A Night Out." A woman must be quite something to steal the heart of a king. As the beautiful healer Talisa on "Game of Thrones," Oona Chaplin is all fire to Robb Stark's ice. She's certainly melted his heart, so much that the would-be king broke an important engagement promise to marry Talisa instead. Chaplin doesn't just play a queen, though; she's Hollywood royalty off-screen, as well. Yes, she is related to that Chaplin, who has been called "the first truly great figure of twentieth-century fame." In the book "Fame in the 20th Century" by Clive James, the author wrote, "'The Tramp' was from the twentieth century. Thanks to the nearly universal reach of silent film, [Charlie Chaplin] was the most recognizable figure on Earth. And the man who played the role made himself famous too." 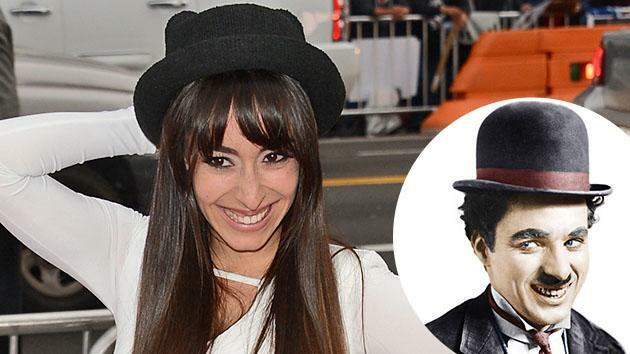 Paying tribute to her grandfather, the "Thrones" star rocked his signature bowler hat on the red carpet of the show's premiere. 1. She's the granddaughter of Charlie Chaplin and the great-granddaughter of Eugene O'Neill. Chaplin is named for her grandmother, Oona, the daughter of the great, Pulitzer and Nobel-winning playwright O'Neill ("Long Day's Journey Into Night," "The Iceman Cometh"). The elder Oona defied her father and turned down author J.D. Salinger to marry the iconic movie star, who was 36 years her senior. The couple had eight children, including the younger Oona's mother, Geraldine. Sadly, Chaplin never met her famous grandfather, who died almost a decade before she was born. "When people say 'Charlie Chaplin' I still think now of the guy in the moustache and bowler hat and funny walk -- I don't think of an old man who was my grandfather," she told The Independent. "I never met him, which probably adds to the confusion. There are moments, even now, when I sort of go 'Whoa ... my blood has some of that in it? It's amazing, but it kind of freaks me out sometimes." 2. She speaks three languages. Since her mother, Geraldine, was an actress and her father, Patricio Castilla, a cinematographer, Chaplin spent much of her early life on sets and visiting family in Spain, Switzerland, Cuba, Scotland, Chile, and England. Thanks to that globe-trotting childhood, she can speak Spanish, French, and English fluently (in that order!). 3. She's an accomplished flamenco and salsa dancer. Chaplin took ballet, salsa, and flamenco dance lessons since she could walk. Some of that may have been inherited from her grandfather. "He was an incredible dancer and I can move," she said. But it also comes from spending time with her father's side of the family in Cuba. Now, Chaplin can often be found heating up dance floors in London. "There's an amazing salsa night at the Colosseum nightclub," she told The Telegraph. "I'll be mainly found in the Cuban salsa room, which is always really hot but the people there know how to dance. I'll be on my feet until I'm kicked out at 4 AM." 4. She's besties with her "Game of Thrones" co-star Natalia Tena, who plays Osha. Not all of the "Game of Thrones" cast works together, since they film in several different countries, but one person Chaplin has gotten close to is Natalia Tena, who plays Osha the Wildling. Her Twitter pics are full of the redhead, who you may also remember as Nymphadora Tonks in the "Harry Potter" movies. 5. She was almost a Bond girl. Chaplin tried out for the role of Bond Girl Strawberry Fields in "Quantum of Solace," but her good friend Gemma Arterton got it instead. For the movie, Chaplin was a "gloried extra. My minute and a half of glory ... I brought in a beer ... and then I ran away. It was a fun five days." While the Bond thing didn't work out, Chaplin didn't have to wait long for her break. Just a couple years later, in 2011, she landed the part of Marnie, the wife of Hector (Dominic West) in the acclaimed British drama "The Hour." "Game of Thrones" airs Sundays at 9 PM on HBO.